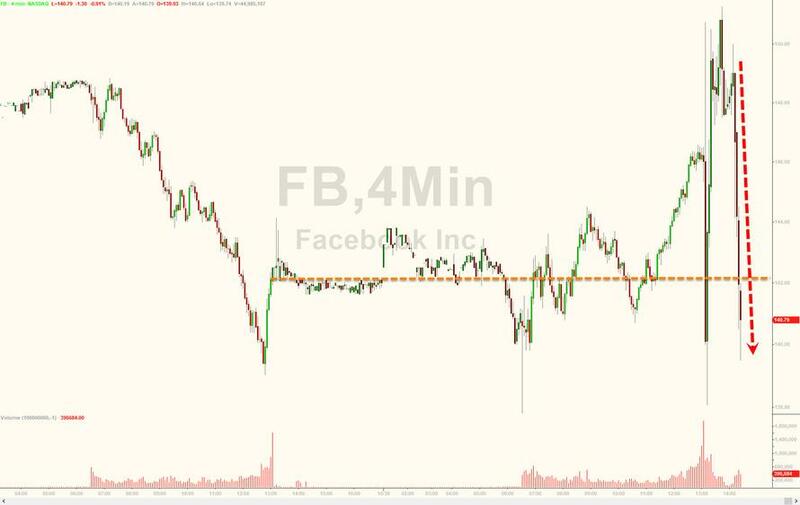 Update: after Facebook shares manged to turn modestly green after the close, the have since slumped again, down over 3% after Zuckerberg said that in order to shift user activity to video and stories, it will have to take activity away from other kinds of social interactions which monetize a lot better. Why stories? Because Zuckerberg wants Stories to be the thing that brings people back to the Facebook core app even though he admit the launch hadn't gone quite as well as expected, and as a result the company was prioritizing that kind of activity over the traditional Facebook feed of videos, posts and news. This is a significant change as "we don’t make as much money from them yet as we do from feed ads." And the red flag: he said 2019 will be another "investment year" as they figure out how to make the stories transition. Advertisers say it increases pressure on them to do unique things frequently. You will forgive an advertiser for seeing the same ad in your news feed over and over, but if you see it multiple times in your stories, taking up the entire screen, you will be annoyed. It's supposed to be ephemeral. Advertisers aren't used to the vertical format for "stories" ads, which is not like the ads they make for TV. They don't like that they can't as easily get interaction from people. If you promote a post on Facebook, for example, you can see what people are saying in comments, and they might share it themselves, giving it a so-called "organic" lift. That can't happen in Instagram. 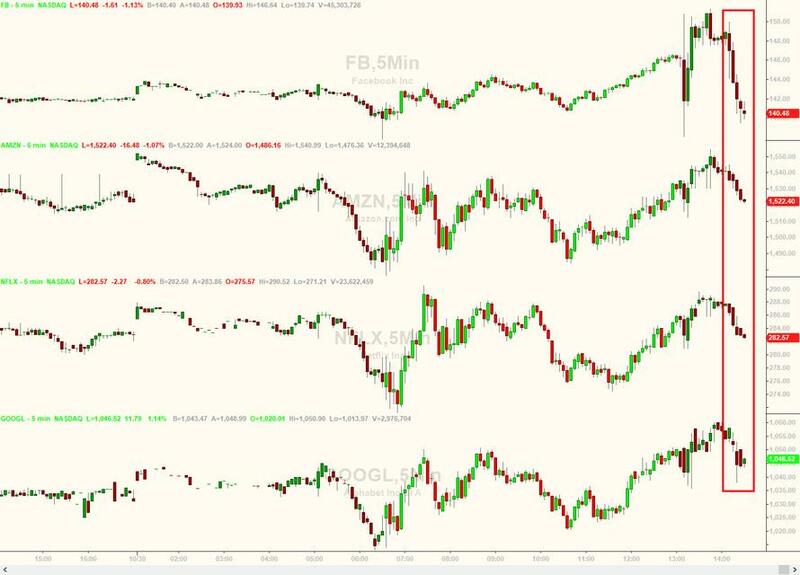 ... and has pressured the entire FANG sector lower. 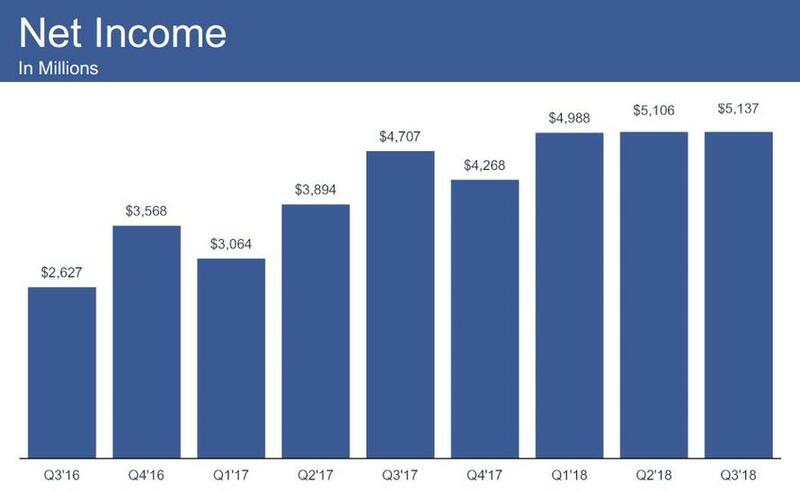 EPS $1.76, Above the estimate of $1.47 but as Facebook admits, this was because "its effective tax rate was 13%, which was lower than expected primarily due to the withdrawal in August of an appellate court ruling in the case of Altera Corp. v. Commissioner." 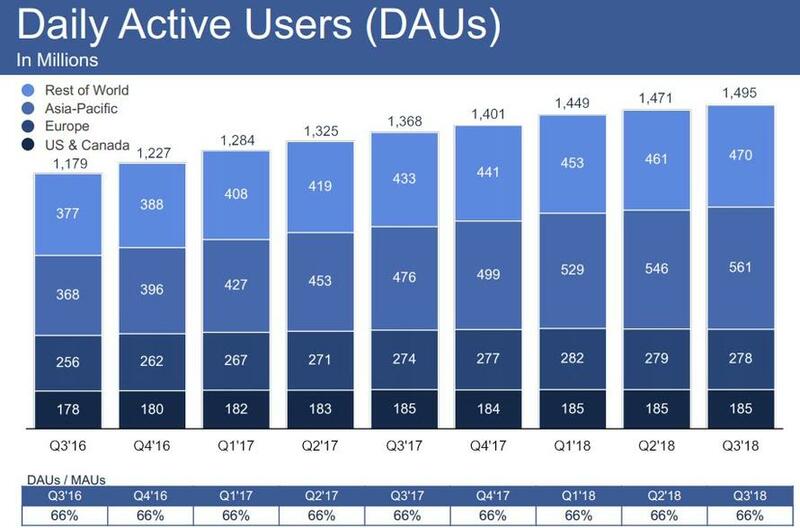 While FB tried to spin the user miss, saying that it estimates that "more than 2.6 billion people now use Facebook, WhatsApp, Instagram, or Messenger each month, and more than 2 billion people use at least one of our Family of services every day on average", the miss in DAUs and MAUs was problematic, even more so since the growth in monthly users to 2.27BN was just 11%, the lowest since well before the company's 2012 IPO. 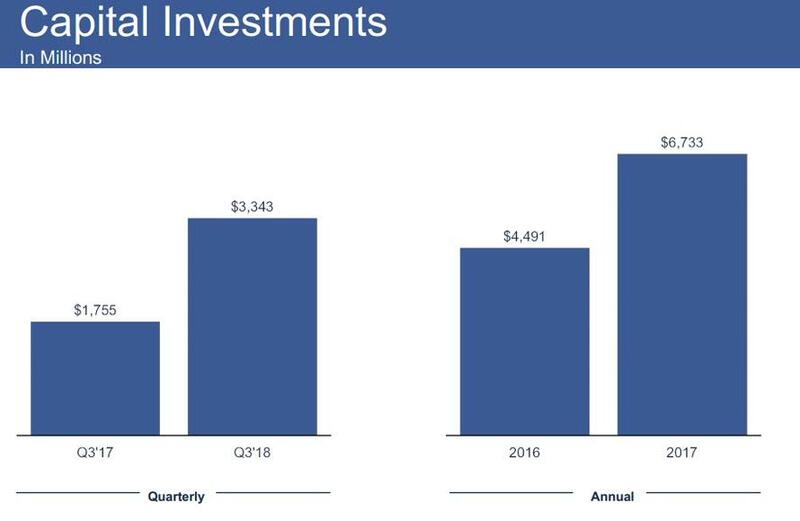 Commenting on the results, FB CEo Jeff Zuckerberg said that "Our community and business continue to grow quickly, and now more than 2 billion people use at least one of our services every day," He added that "we're building the best services for private messaging and stories, and there are huge opportunities ahead in video and commerce as well." Digging into the details, US and Canada DAUs were flat for the second quarter in a row at 185MM, while Europe posted a second consecutive decline. 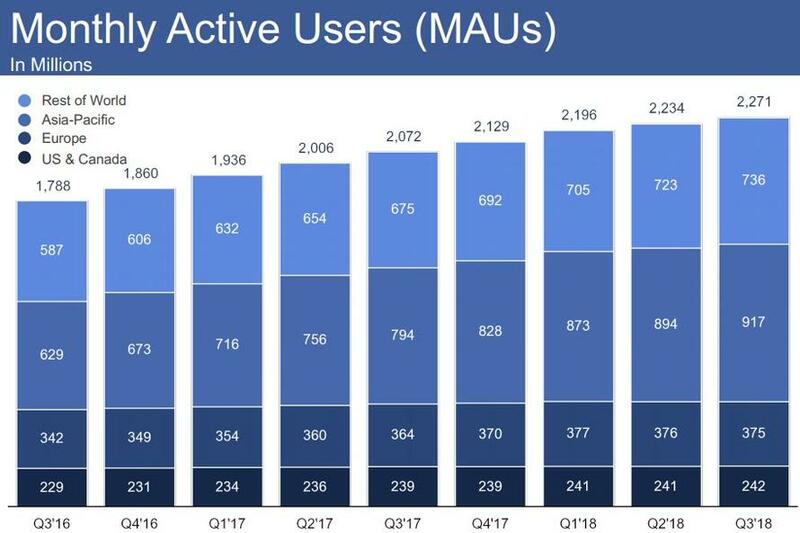 Monthly Active Users hit 2.271 billion, and while US/Canada MAUs rose to 242MM from 241MM in Q2, Europe posted a second consecutive drop here too. 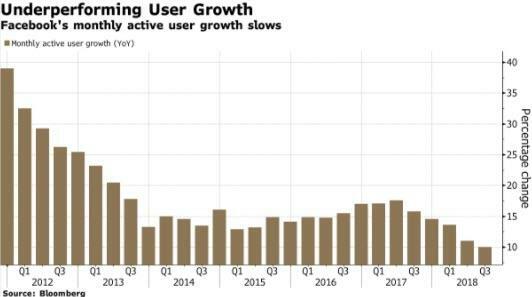 Still, the data was spun as having a "slight uptick" in North American users, which pushes back on the big concern around the company, that growth has plateaued in its high-value markets. There was no way to spin the drop in European users. 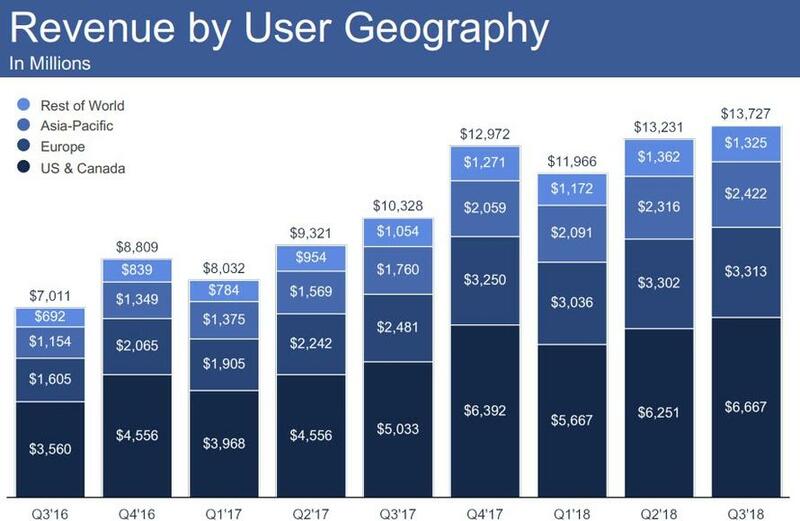 There were no surprises in revenue broken down by geography, where the US led with $6.7 billion, half of the company's total $13.7 billion. There were some more surprises at the expenses line, which rose across the board, to the highest level since Q1 2017. 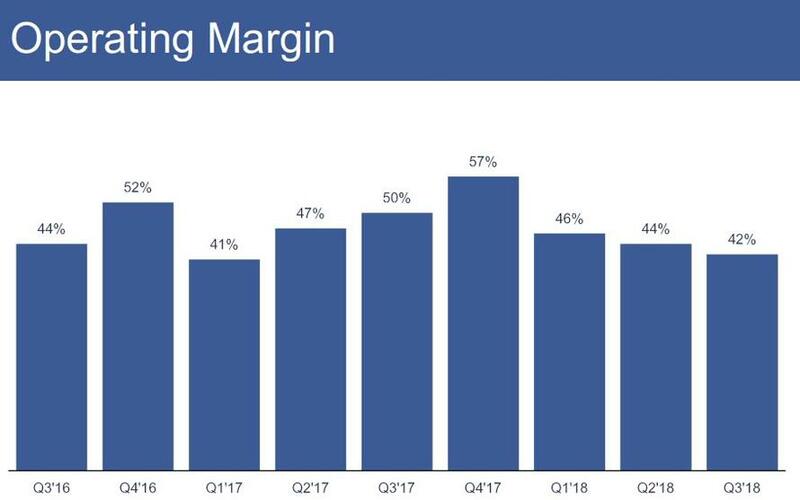 But the biggest surprise is that Operating Margin slumped from 44% in Q2 and 50% a year ago to just 42%, the lowest since Q1 2017. The result: net income has been flat for three quarters despite continued top line growth. Meanwhile, Capital spending is soaring as the company warned last quarter, up almost double from $1.755BN in Q3 2017 to $3.343BN this quarter. 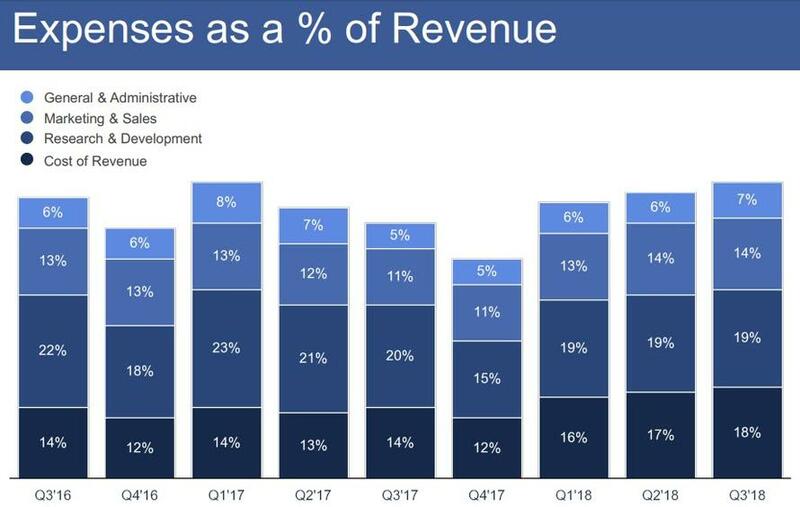 And with flatlining revenue growth, declining margins, and soaring capital spending, it will not come as a surprise that Facebook's Free Cash Flow actually declined from last year, down to $4.2billion from $4.4billion. In kneejerk reaction, the stock was first down, then modestly higher after hours, a far cry from the 20% plunge a quarter ago.